As I have once again been reading through the story of David in the Old Testament, I have been struck – again – by what a tremendous man of God he was. With the obvious exception of his encounter with Bathsheba, the decisions David made, the counsel he gave was so often selfless and God-focused. He was a good man who did his best to follow the Lord, and who always wanted what was best for his people. I’d like to be more like that. It also struck me, though, that David didn’t do what he did alone. He surrounded himself with people he could trust. David’s special three warriors and his hand-picked thirty (see especially 2 Samuel 23:8-39), were with him through thick and thin. Any one of them would have willingly died for him. David also made sure he had wise spiritual counsel. He sought wisdom from Ahimelech, the priest, several times. He also had Nathan, the prophet, and later, another prophet named Gad, keeping him accountable. There were others; too many to mention here. I once heard Chuck Swindoll say that after Jesus, the person whose life he admires most is David. I can understand that. Yet, it seems to me that if you were to remove those trusted and faithful companions from David’s life, that his story would be radically different. So here’s my question for you: Who are your trusted companions? To whom do you turn for wise spiritual counsel? And, perhaps just as importantly, in whose life are you helping to fulfill those roles? 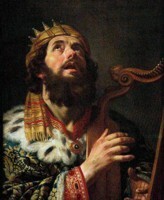 This entry was posted in Scriptural Perspective and tagged King David, spiritual accountability. Bookmark the permalink. What a great truth. I love how the Bible calls them his mighty men! I am so thankful for the mighty men and women God has put in my life. I’m blessed that many of them are family members, and I’ve also been blessed by amazing women who have prayed with me and challenged me. If David needed wise counsil and accountability how much more true that is of us. Excellent blog! Many or perhaps most times in peoples lives, it’s the company they keep that brings them down or leads them astray.